To give you an idea of what producing a novel entails, I thought I would try and update my blog every so often. Then you get an idea of the journey that the story ‘Forest Brothers’ has gone through. It will be like walking through a deep Estonian forest but with less midge bites. 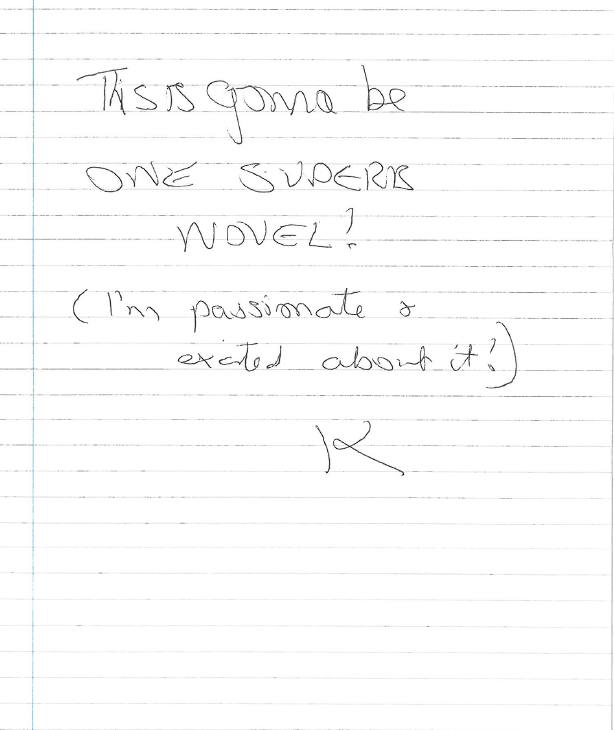 I received back my manuscript from the publisher. 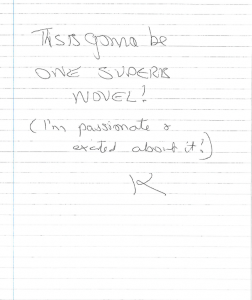 She put a sheet of lined A4 paper at the front, where she had written in big letters ‘This is going to be a superb novel.’ Well, I’ll attach the photo so you can see. It’s very informal and a wonderful boost to morale. I have it as a screen saver,for when I need inspiration. The manuscript that was returned was full of biro notes, done in a very artistic and pleasing manner. Seriously though, my initial emotion was amusement. I immediately saw why she said ‘will be’. You can look through a story a hundred times and it won’t have the same effect as a critical opinion from a third party. You’ll even miss spelling mistakes. Your eyes become lazy. Your mind tells you the story it knows, rather than you reading the page. You can lose perspective. It’s hard to stand back. Also, colloquial speech, social networking, e-mails and texts makes me incredibly lazy with the English language. Read my blog further, and I’m sure it will stick out like a sore thumb. English wot she is wrote. I am busy working through the manuscript (Mss) and have sent the first 20 pages back for a sanity check. The response was positive. Exactly what was required – only can we do these extra changes, followed by more biro. It seems to me, that when you edit sometimes it gives you a clearer picture of what needs to be done, so you can tweak the tale even further. It’s like clearing a box room and believe me… I have an untidy mind. Should I feel frustrated? I actually feel happy. The fact is the tale is getting honed and it’s a step closer to the end goal. Even if it feels like baby steps on occasions.